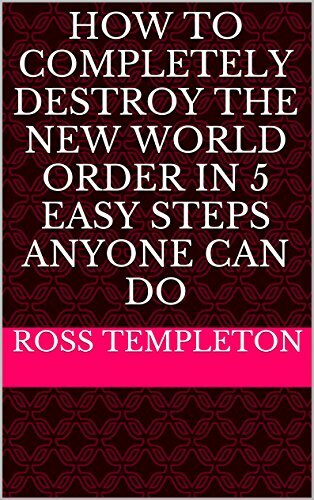 In 5 Easy Steps, Ross Templeton lays out the blueprint for destruction that, if undertaken by more than 50% of the American population, will eradicate the New World Order agenda in the twinkling of an eye. Can you wait in line? Can you tie your shoes? Can you chew bubblegum and walk at the same time? If you answered yes to any of these questions, then you will have no difficulty at all in putting any of these steps into practice. What is the New World Order? In a phrase, it is World Government by Multinational Corporation. The textbook definition of fascism is something about government and corporations getting into bed together in order to feast on the blood bags that make up the subject population. Therefore, the New World Order is nothing more than a global fascist regime that intends to have jurisdiction over every piece of dirt on the planet. Don't be fooled by the laser light show. That's all it is. Lights and dazzle and the hologram of Total Control. They're no more in control than they are superior to any of us. See how easy it is to kick over their apple cart. No violent revolution required. Revolution is for retards. Revolutions never remove the apparatus of oppression. Just merely change out the criminals running it.